Sigma Retail Partners have been appointed as the Retail Asset Managers over Dungarvan Shopping Centre in Waterford. The shopping centre was acquired by the new owners along with Thurles Shopping Centre, Johnstown Shopping Centre, Navan and Harbour Place Shopping Centre, Mullingar all of which are also asset managed by Sigma Retail Partners. Dungarvan Shopping Centre comprises over 10,000 sq.m of retail space with significant asset management opportunities. The centre also includes residential, office and medical accommodation and provides future development opportunities on two adjoining sites comprising c. 0.41 ha (1.03 acres) and 1.42 ha (3.51 acres). Both sites are zoned town centre. Sigma Retail Partners have been appointed as the Retail Asset Managers over the centre and are working in collaboration with the appointed fund managers, Davy. “Within a very short amount of time since our appointment, Sigma Retail Partners, in collaboration with the entire team, have been in a position to implement several important value adding asset management initiatives including new lettings, lease regears and improvements to the centre’s 450 spaces car park. Our work will continue over the coming months and years with a view to reinforcing Dungarvan Shopping Centre’s rightful position as the dominant shopping destination within the catchment”. Dungarvan is a town which had been targeted by the fund given its strong demographic profile and proximity to Dublin. Approximately 49% of the catchment is within the top tier social class (ABC1). Dungarvan Shopping Centre opened in 2004. 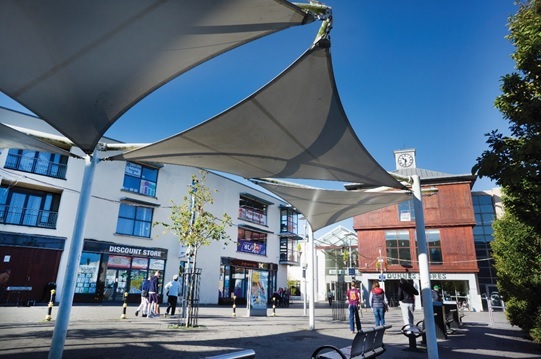 The shopping centre is well positioned in the centre of a large mixed use Town Centre scheme which immediately adjoins a multiplex cinema, Lidl, Aldi and McDonalds. The current tenant line up include Dunnes Stores, Lloyds Pharmacy, Easons and Shandon Medical Centre. The centre will continue to be enhanced by Sigma Retail Partners on behalf of the new owners over the coming months and years. Bannon have been appointed as letting and property managing agents in respect of the portfolio.